Description: Vermont Railway #308, in Guilford paint with the old B&M logo still visible on the nose after all these years! Description: VTR engine 308 awaits permission to open up the crossover at the north end of Whitehall yard and put its train together, a high and wide load moving east over the CLP and GMRC to the NECR for final delivery at Bethel, VT The transformer and car weigh 389 tonnes combined. 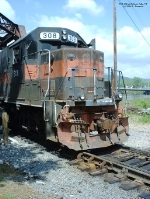 Description: VTR 308 waits in Whitehall, NY for permission to crossover the CPRS main ( on the right side of photo) and head onto home rails for the journey over the Green Mountains and interchange with the NECR in Bellows Falls. Description: The 308 is now on VRS rails, heading east. The train is at Mi. A80.5, approaching Peters Crossing. Description: WACR northbound WJNP passes old trackside industries on a snowy evening in Barton, Vermont. Today's train consists of VTR GP40-2 308 and 9 cars of mixed freight. Description: WACR southbound plow extra has derailed at Hayden Crossing just south of West Burke, Vermont. Today's train consists of VB plow VB101 and VTR GP40-2 308. Description: Vermont Railway GP40-2 behind the shops in Rutland. Description: Vermont Railway unit takes a break behind the shops just south of downtown. Description: WJNP heads north crossing under the access rd for Exit 22 on I-91. Description: WJNP heads north alongside US 5 south of Wiedmann. Train will stop for a crew change. Description: 308 stops on US. 5 to switch out crews. Description: WJNP stops for a crew change. Description: 308 passes Automatic 38. At one time the southbound signal would have lit red. Description: WJNP rounds the curve northbound on the Newport Sub. Description: WJNP curves north toward Newport. 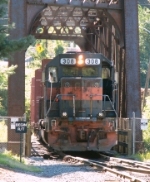 Description: WJNP passes CP 34 northbound on the Conn River Line. There was once double track through here which has since been removed to the right of the engine. Description: WJNP rounds the curve northbound on the Newport Sub approaching Rt 114. Description: WJNP northbound on the Summit grade approaching Bugbee Crossing. Description: WJNP crosses the west branch of Passumpsic River. Description: WJNP comes north passing past Automatic 29. Description: WJNP rolls north climbing the grade toward the Summit of the Green Mountains in Sutton.